--The defending Super Bowl Champions started training camp in our backyard, and 2008 NFL Defensive Player of the Year James Harrison reported driving this vehicle. That was probably a post in itself had I seen it upon original release. Wallace, on the other hand, brought numerous forms of entertainment to his first camp. He brought a 42-inch, flat-screen television, a small movie collection -- including "The Hangover," "Pineapple Express" and "The Dark Knight" -- PlayStation 3 and an iPod. As emailer John G. points out, would that be a DVD of the same "The Hangover" that's currently in theaters right now? Yeah, probably not a wise idea to mention that to a newspaper reporter. --THE Raul Mondesi running for Mayor opposite THE Jose Rijo in the Dominican Republic. This is clearly the biggest Mondesi-related story since the famous electricity-stealing scandal of 2006. --Tom Gorzelanny and John Grabow were dealt to the Chicago Cubs, as the Pirates' front office remembered that they are contractually obligated to help the Cubs in a stretch run whenever possible. It was a sad day for me only from the standpoint that I'll have one glaring hole in this year's much-delayed "Pittsburgh Pirates: the Movie IV" post. 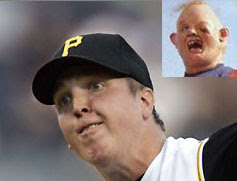 Gorzo and Sloth from The Goonies...that was just inspired casting. --It took Boston GM Theo Epstein all of six games to realize what it took the Pirates two-plus years to figure out: his team is better off trading Adam LaRoche. Yes, Hans Klopek was flipped back to his original haunting grounds of Atlanta for Casey Kotchman in a dramatic swap of medicocrity. LaRoche joins an Atlanta nucleus that includes Nate McLouth, Mike Gonzalez, and David Ross, which means the Braves should go 68-94 in 2010. --Andrew McCutchen hit three home runs and drove in six on Saturday night against the Washington Nationals. Amazingly, was still on the roster and not traded to the Red Sox on Sunday morning. --The Pirates were beaten by the Washington Nationals on Sunday, and the win went to Sean Burnett, the same Sean Burnett that built a shrine to Nate McLouth after his trade and called the Pirates "the laughingstock of baseball" recently. By the way, the team Burnett now plays for is 33-72. Certainly not laughingstock material by any measure. Now that we're up to speed on three-day-old news, it's time to look forward to the week ahead. We've got one more Pirates-Nationals game to endure, a three-pack with the D-Backs, and most importantly, lots more football to talk about. Limas Sweed was the star of Sunday's practice? Oh yeah, that's just a sneak preview of what's going to be a great week of talk. Pirates VS Nationals on a Monday. A marketer's dream. They could at least throw in a cooler bag or kid's back to school back pack (I guess they are saving those big guns for later this week). McCutchen's obviously pretty smart. He realizes the faster he can prove to the Pirates they can't afford him, the sooner he'll wind up on another team. If he keeps hitting well, all he'll need is rookie of the year and an all-star appearance and he's gone in 3 years. Pedro better be taking notes. thank goodness for A post, i was having withdrawals!! I was saying that is was good thing he didn't hit 3 HRs in a game before the deadline of he would have been gone as well. Wow. 17 seasons of losing. Now it looks like 6 more seasons of reading idiotic comments about trading McCutchen. Good one Jonny! 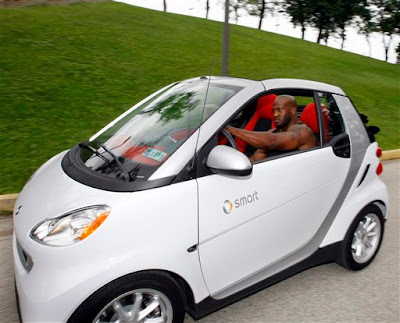 James Harrison and Smart Car; is this a new trend or a comment on his new contract? Because it would be so out of the question for the Pirates to trade a high ceiling player before they would have to pay him? I forgot, this is the best FO in baseball we are talking about! Harrison in the Smart Car is the best pic I have seen in a while for sure. He'll be relatively cheap for six more years. Unless they totally break character and start paying him the big bucks immediately. Hence six more years of hearing and reading fans make the same lame joke about trading him. I don't know, I must live in a different world than most people on here in which i would have no basis to believe the Pirates would trade a talented payer for minor leaguers in lieu of paying a standard major league all star salary to that player. Seeing as I am a total lunatic, I am officially retiring from commenting. If in 6 years McCutchen is the league MVP and triple-crown winner, but: the team is 68-94; the other starters on the team are of a caliber that they attract only luke-warm trade interest; the other players on the team are borderline minor-leaguers; and the farm system is ranked last in terms of upcoming talent....then yes, trade him, get a boat load of prospects and start over. Either that or see if Matt Morris is still available for $8M a year. You're craaaaazy, the Pirates would never do that. Seriously, it's going to be fun watching Nutting's coin purse (pun intended) tighten if all these prospects and draft picks wind up turning into something special and start winning and challenging for the division in a few years. Now, we know that's not happening, as Nutting won't let it get to that point but it'd be exciting to see him have to put his money where his mouth is. "I'll pay if they win" Sure Bob, sure. any chance the Pirates could bring back Jeff King to play first base? I think that his veteran leadership, clubhouse personality, and natural ability to communicate with the youngsters is something Nutting & NH have been looking for. Also, i read on the cover of USA Today & Sports Illustrated that there is a push in the pittsburgh area, and the country for that matter, to get Jeff King's #7 retired. Not only in the burgh, but retired in all major/minor/little league/pop warner sports. Of course Ben would have to change his number, but according to Roethlisberger, "You look at a guy like Jeff King, and he is the best athlete ever. I would have no problem giving up my number to honor this true warrior." Jeff King would want big money tho. I thought Mike LaValliere was the best athlete ever? However, I do suspect steroids were a big reason for his dominance over mere mortal players. Lavalliere's steroids were sprinkled on his donuts.